One… one time I visited the Haight this week. My mind was clear and calm as I rode my bike through the park, passing by the track runners at Kezar stadium and through the skater’s at the lot converted skate park on Waller and Stanyan streets. I had no plan in mind. It was just another day in the Haight for me, with my notepad and camera tucked away in my bag, ready when I was. My keen sight and eager heart shone on my face and I rode into the Haight like I owned it. It was as if everything calmed and moved in slow motion when I reached the social hub of Golden Gate Park at Haight and Stanyan. I stood there and remembered my first days reporting this semester. I remembered just how terrified I was. Blog1: Haighters Gon’ Haighten‘, was my first published article on my very own neighborhood blog. I remember I read through it, over and over, just to have a feel for the flow of the language I used, to see which words appealed to the senses and what worked in placing a reader in the middle of the bohemian neighborhood. I remember how the overwhelming mix of characters, colors and voices—although unique—seemed to have a uniformity to their presence. They were/are—all Haighters. Back at Haight and Stanyan, standing where it all started, I saw the Haighters. They were a mass of people that moved through the streets with the fluidity of a body of water. Every body that entered or left the flow, was like a ripple in the stream. I approached. Seeing the creases in people’s squinted faces shading their eyes from the sun, I noticed that their expressions were unwavering. I had entered unnoticed and unbothered. I, myself, have become “Haighted”. This semester in reporting has been a great challenge in overcoming the fear of approaching people. Especially in a neighborhood like the Haight where the abundance of loud personalities is quite overwhelming. But once I got over that fear… once I realized that everyone I interviewed is a person with some human quality in which I could relate, I couldn’t stop. I love reporting. I love writing. I love what I do. His rolling suitcase barely zips shut. The overstuffed bag on wheels wobbles awkwardly, bouncing on the uneven pavement as he pulls it behind him like a disobedient dog on a leash. He reaches his destination and the sound of crashing glass, clanking metal and working machinery is a mismatching of the green-growing garden before him. He picks his spot next to a series of trash bins and unzips his bag and outflows his daily collection of recyclables. Gregory Paris unloads his collected recyclables. “I’ve been homeless, recycling for about five years now,” says Gregory Paris, a daily customer of the Haight Ashbury Neighborhood Council recycling center. Paris, says he comes to the center at least once a day. He makes his money by collecting recyclables from the park and the beach. He says that he goes deep into the bush and shrub where no one else will, because for one thing— it needs to be cleaned and for another—he needs money to survive. The HANC recycling center at 780 Frederick St. was at one point considered to be an innovative contribution to the community for people like Paris. 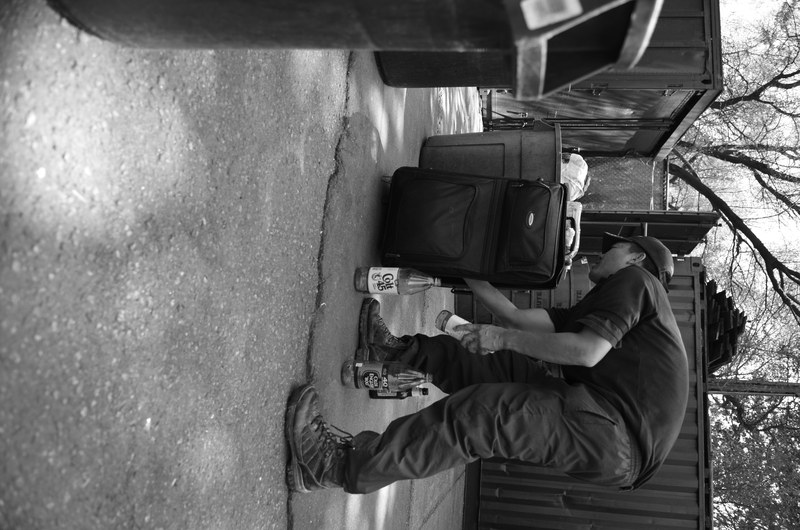 In the present day with citywide curbside services provided by Recology, the center is considered obsolete and an unfitting industrial business that attracts an unwanted homeless population to the Haight Ashbury neighborhood, according to the Recreation and Parks Department. Holding the lease, Recreation and Parks has sent three eviction notices which HANC has ignored and finally appealed. HANC went into an unlawful detainer action arguing that there are political motives behind the eviction. Recreation and Parks plans on using the space for a more “appropriate” use such as a community garden, and nearby neighborhood organizations stand behind that agenda. Magary argues that Golden Gate Park simply is not a suitable site for a recycling center anymore. “They’re trying to play by how recycling was done 20, 25, 30 years ago when it’s a completely different situation now,” states Magary. HANC has been at its current location since 1981. At first, the center existed only as a drop off donation center and in 1986 the Bottle Bill was enacted and the center was fully certified for California Redemption Value by 1987. “The Recycling Center was a tremendous asset for its first 10 years but when the city instituted sidewalk recycling—thanks to the example set by HANC—the drop-off function became redundant,” says Karen Crommie, president of the Cole Valley Improvement Association, who is also in favor of the eviction. Since the start of curbside disposal in the early ’90s, HANC has been struggling to prove itself to the other neighborhood organizations. According to Ed Dunn, the HANC recycling center site director, the ongoing battle has always been political. Dunn says that in 2001 the lease had expired and HANC was on a rolling month-to-month contract. After that happening, with the continuance of the group’s political stance on certain issues— such as their opposition to the sit-lie ordinance—came the political feud that fueled the fire for the eviction at hand. “The neighborhood politics were getting hot as ever,” says Dunn, and in 2010 HANC heard word that various neighborhood organizations teamed up with Recreation and Parks and Gavin Newsom, whom was mayor at the time, and planned to evict the center to replace it with a community garden. 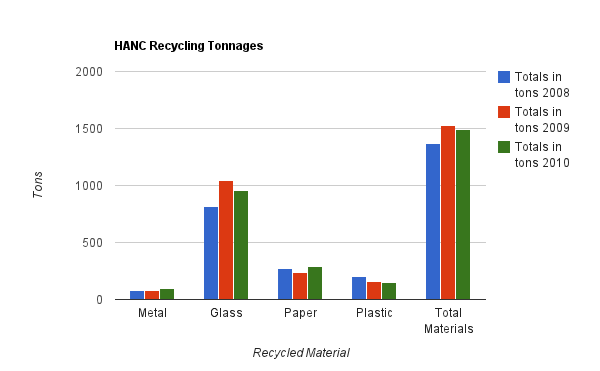 According to Recreation and Parks, HANC provides only .1 percent of the city’s total recycling tonnage. In an agenda dated Nov. 29 2010, just one month before the first eviction notice, Recreation and Parks state that “the San Francisco Department of the Environment is confident that recyclers that use the facility will take their material to another existing site.” Therefore, they feel that there is no longer a practical use for the site and that a community garden would be more beneficial for the neighborhood. Ted Lowenberg, president of the Haight Ashbury Improvement Association, says that there are two prominent issues involving the recycling center. Lowenberg states that it is time for the center to vacate and by refusing, HANC is invalidating the legality of their contract which is setting a potentially harmful example for the neighborhood. “Their lease is over and its their time to go, period,” says Lowenberg. HANC is aware of the circumstances and is taking it upon itself to do whatever it takes to stay. “So in the middle of last summer I said, ‘screw it!’ ” says Dunn. He and his team created their own community garden infrastructure. Crommie says that HANC is trying to “stall” and “undermine” the eviction process. “The underlying issue is the community anger resulting from the fact that after Rec and Park issued the legal eviction it planned to replace it with a community garden managed by the Rec and Park Department’s community garden program,” says Crommie. Crommie argues that there were expectations for a Recreation and Parks operated community garden that is now on hold. The fact that HANC took it upon itself to implement a community garden itself is an example of how “HANC feels that the property belongs to them,” according to Crommie. Many neighboring business throughout the Haight Ashbury are unaware of the debate. Though they are unfamiliar with the politics, some still had a perspective. Becky Dill of Cold Steel America Piercing and Tattoo, says that her business benefits from the center and that she does not see the recycling center contributing to theft or to the homeless population. Brad Woehl, owner of American Cyclery on Stanyan Street is familiar with the politics, but still is unsure where he stands on the issue. “People in the neighborhood that use the recycling center come by our store and push their shopping carts full of their bottles and cans… everyday,” says Woehl. He says that not only is it distracting but it is bad for business in that it creates an unpleasant atmosphere. However, he sees HANC as an asset to the community. The mural painted on the side of the building to his business was done thanks to HANC. “The funds needed to paint the mural and pay the artists came from money from HANC,” says Woehl. BVNA, HAIA and CVIA amongst others stand in their fight behind Recreation and Park, and do hope that the current site facilitated by HANC will eventually be vacated. All organizations involved firmly believe that the “CRV redemption program encourages and provides incentive for illegal poaching” and “enables illegal camping and illicit and unhealthy behavior,” according to the Recreation and Parks proposed agenda. The appeal at hand is still being processed and there are no court dates scheduled. HANC was granted a stay as of Aug. 13 2011, while the appeal is processed. Dunn says he expects to be in court by June. Nevertheless, he remains hopefull. “Hopefully at the appropriate time the mayor will look at this issue and tell Rec and Park to lift the eviction,” says Dunn. Until a decision is made, customers like Gregory Paris will continue to use the facility in hopes that it will remain. Emptying his bag full of recyclables, swiftly separating bottles from cans, Paris further explains the necessity of recycling centers. He says that it is his lively-hood and the city needs to be cleaned up. On a Sunday morning 9 a.m. arrives followed by guests filing down the stairs and locals rushing through the front doors. 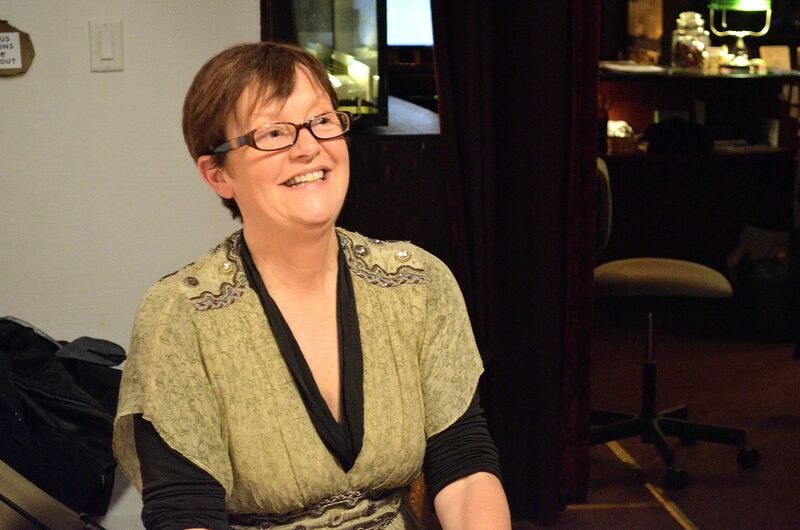 The café fills with voices and laughter as conversations spring up at each table. Near the front entrance there is a table reserved—but not for a private party—everyone is welcome and everyone was invited. It is about to begin and a group of seven gathers around with their attention focused on a woman as they anticipate how their breakfast conversation will unfold. Sami Sunchild spreads peace one conversation at a time. “What are you doing to contribute peace to the world?” asks Sami Sunchild. Her bright sky-blue eyes, wide with excitement and glistening with hope matched her soft-spoken voice, weathered by age and wisdom. She explains that they will introduce themselves, describing where they live and what they see when they look out their window so that everyone can learn and share his/her perspective as they discuss what they are doing to make the world a more peaceful place. Thus begins this Sunday morning’s Peaceful World Conversation. Peace symbols can be found throughout the Red Vic. The Red Victorian Bed & Breakfast Peaceful World Center at 1665 Haight St. is Sunchild’s life’s work and permanent residence. It only makes sense that as a single-independent woman she would find peace in San Francisco when she stumbled upon an indefinite opportunity—the Red Vic— back in 1976. Sunchild says that San Francisco is “famous for being open minded and creative,” and that tourists “never touch the heartbeat of San Francisco.” She wants to show people that it is a place that “is alive and full of possibilities, full of living your life.” She says that is why she paints the peace symbol, because it is a universally understood symbol that attracts people. 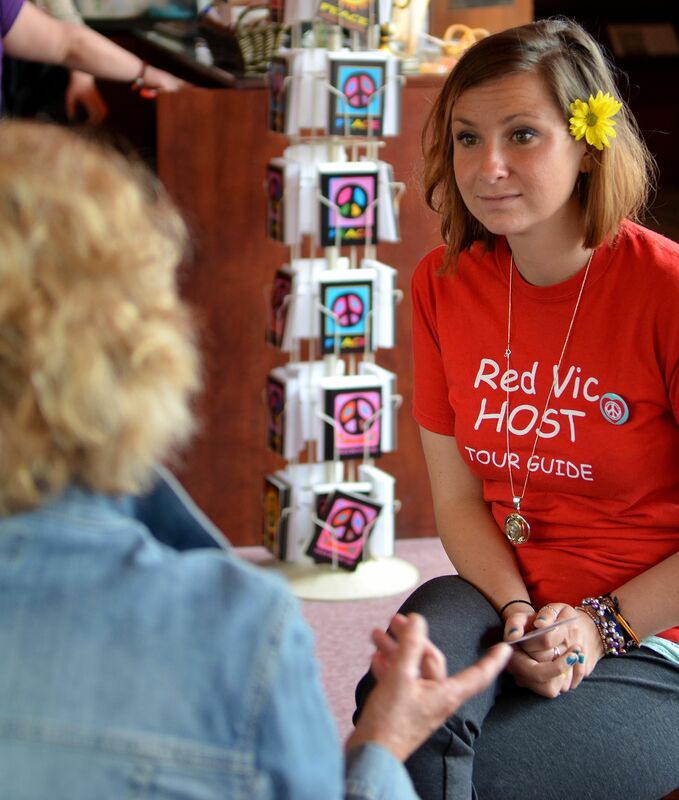 Red Vic host Danielle Barnett, sits and talks with customers in the café throughout the day. Sunchild visually fortifies peace throughout the building. Her therapeutic methods of painting are not only hung for display on the walls, but the building itself is an example of peace and love. The building’s exterior is painted red, even the inside is carpeted in red and “red is the color of love and passion,” says Danielle Barnett, host and tour guide. Ugyen Dolma, a fellow businesswoman and shop owner of Tibet Styles, just doors down from the Red Vic, has had an ongoing relationship with Sami for the past 10 years and says that she feels the peace and the love from the Red Vic. Dolma reminisces her first encounters with Sunchild and how she joined in on a Sunday morning’s Peaceful World Conversation. Kate Hockett, a Red Vic receptionist, says that Sunchild makes those moments happen. Hockett says that people will be seated alone spread throughout the café and Sunchild will walk up to the individuals and introduce people and make conversation. 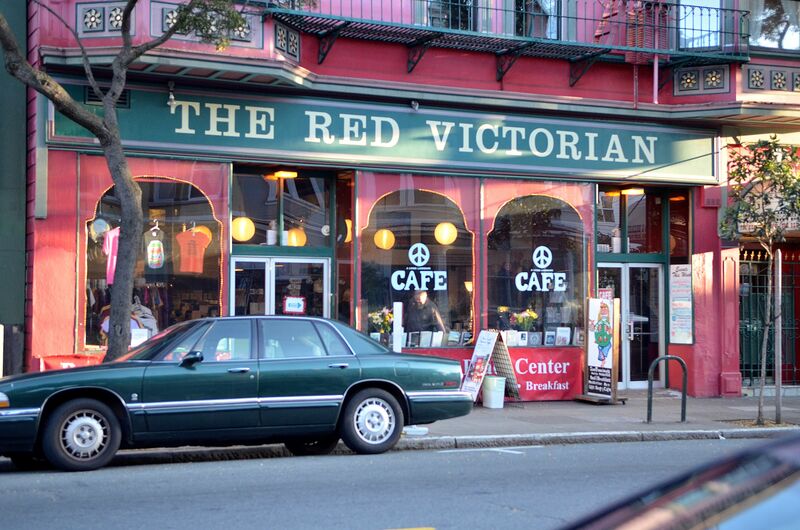 The Red Victorian used to be the Jefferson-Haight Hotel. Alezeia Brown, a guest from Brisbane, Australia, was on vacation with her partner Justin Wiles and they stayed at the Red Vic and were able to experience the Peaceful World Conversation first hand. She continues to explain her impressions of Sami. “Now [that] I have met her and learned some of her story I think her dedication to improving the world one conversation at a time is admirable. Sami is Genuine,” says Brown. “She’s amazing. 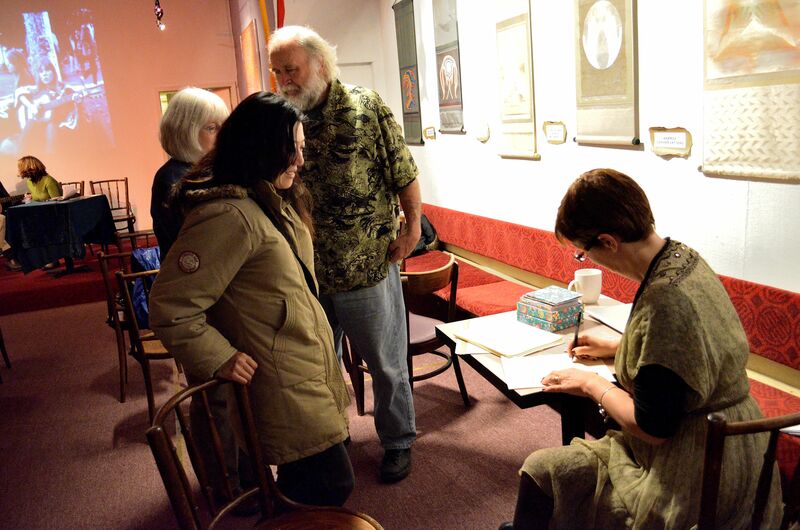 [After] meeting her for the first time I feel honored,” Wiles adds. Though, Sunchild has been accepted by many people, there is still a need for recognition in Haight Ashbury community. 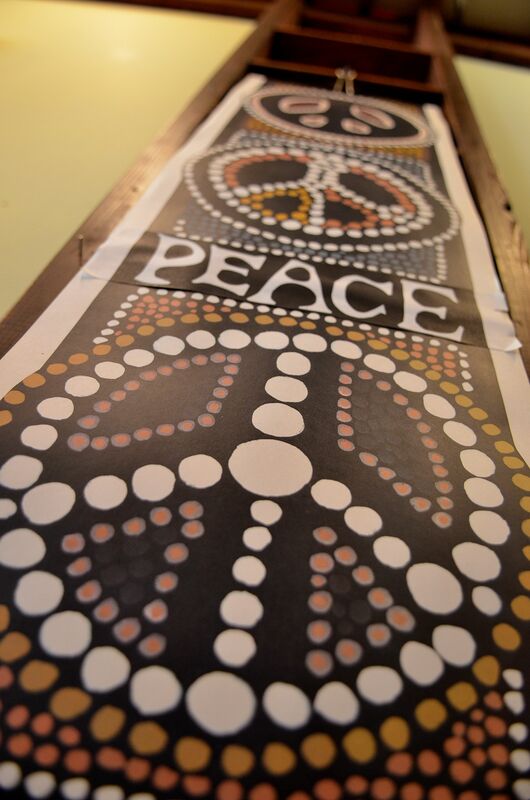 Laurie Marshall, Executive assistant and peace networker of the Red Victorian explains that there has been so much negativity on Haight Street, and that many times Sunchild and the Red Vic have been overlooked and misunderstood. 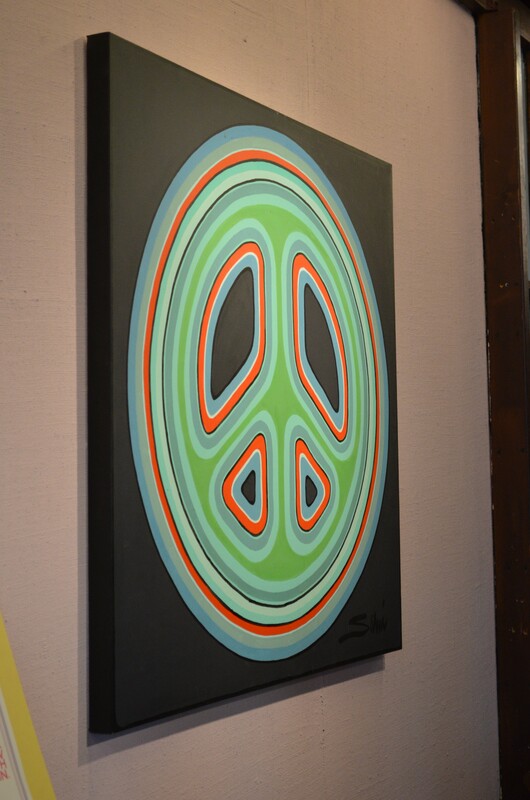 Sunchild paints the peace symbol because it is universally recognizable. A local shop worker, June Smith, from Decades of Fashion, just next door to the Red Vic, agrees and hopes that Sami’s peace and love would spread. Nevertheless, Sami Sunchild is still fighting and she will not give up. 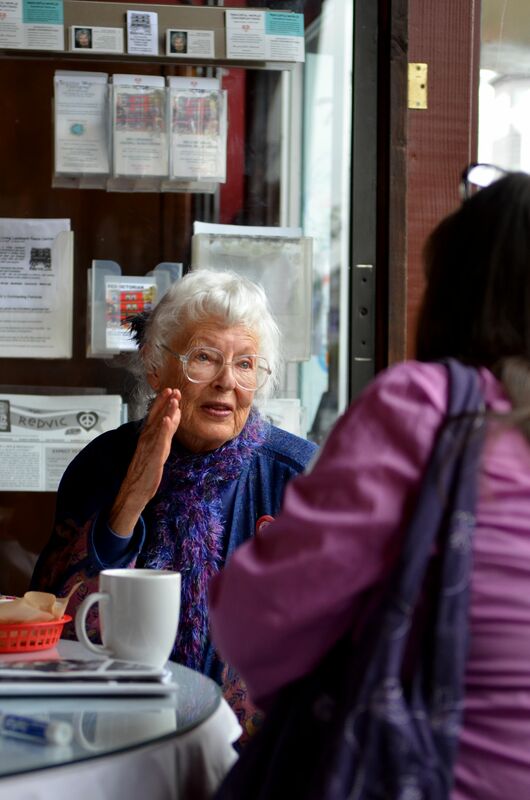 Now an 86-year-old woman, Sunchild sits in her café and recounts how she struggled since she was just a little girl. Osteomylitis, an infection in the bones of her leg, consumed her childhood. She said that as a nine-year-old girl she found her life’s worth after nearly dying. “I was here for something. [My parents] gave me a feeling that life is worth living and you can contribute something,” says Sunchild. 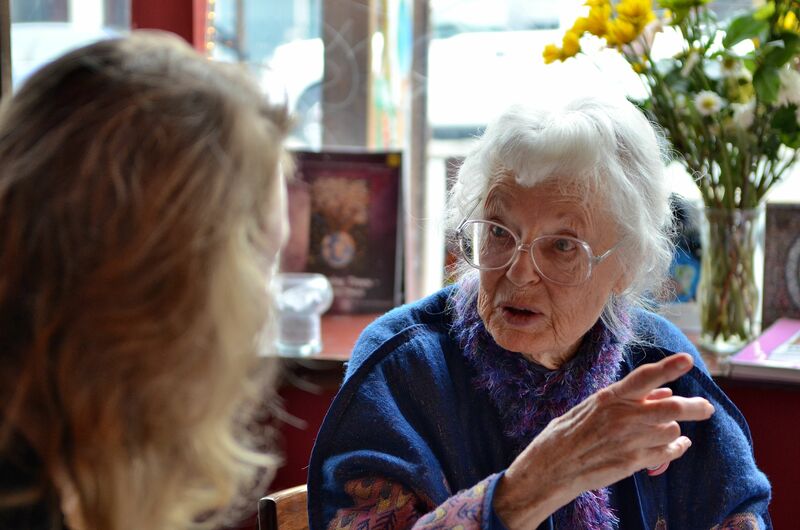 Sunchild devoted her life to changing the world and promoting peace. She graduated with an M.A. and Ph. D from Columbia Pacific University. Studying Transformational Art and Societal Change established the foundation that led her to greatness through peace. Sami Sunchild works seven-days-a-week to promote peace. After living in multiple cultures, marrying twice and adopting two children, Sunchild found the Red Victorian. It became hers, and she had established her life as her own independent person and with that ideology she wanted to create herself as she thought she was. In 1977 she legally changed her name to Sami Sunchild and even had a name changing ceremony. She had bore the name of three men before, and now she wanted her own. She chose Sunchild, because the sun is the source of life and she says that we are all children of the sun. As her own woman, Sami Sunchild has only one thing in mind. The extensive amount of marijuana sales in recent weeks in the Haight Ashbury has led to police action, according to smoke shops and street dealers. There has been an increase in enforcement against the offense. Undercover officers have been approaching people in the streets asking if they know where marijuana is sold and when the sale is secured, the arrests are made, according to street dealears. 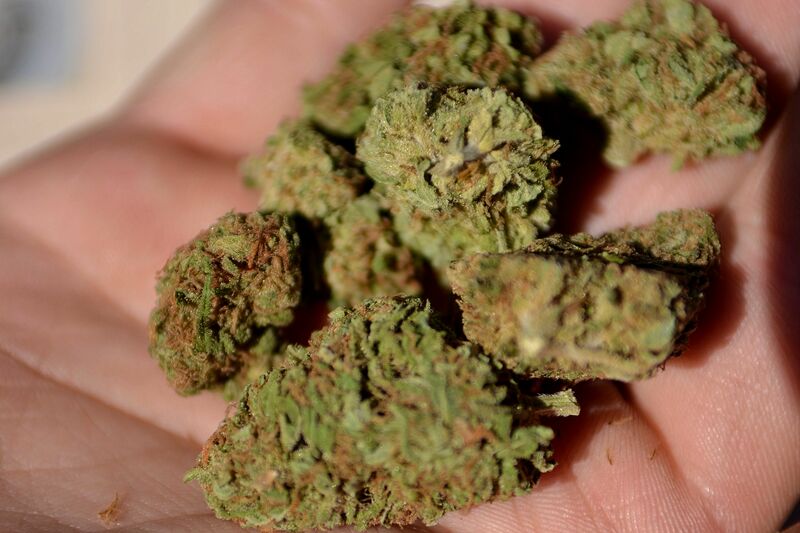 A dealer shows a potential customer the "green'" he has to offer. Mission explained that before the arrest, a suspicious person asking for marijuana approached him. He felt uncomfortable so he denied having any connections to drug sales. He then saw the same person approach every “street kid” on the block asking for marijuana. “Thirty seconds later they arrested me for sales,” said Mission. He said that once the officer found a seller, seven to eight undercover officers swarmed the dealer and made the arrest. Similar instances have occurred up and down Haight Street according to shop workers. In front of the store The Cannabis Company at 1334 Haight St. a man was smoking marijuana and was ambushed in the same way. Eric Rosenberg, piercer at Braindrops just next door to The Cannabis Company remembered the occasion. Allan Sprague, manager of the Cannabis Company, said that the man arrested in front of his store is a local “street kid” who stops in on occasion. “All of a sudden I’ve heard that they are on the hunt for the small-time weed offenders,” said Sprague. He said that customers have been coming in and telling him their stories of their run-ins with these undercover officers. “There have been 60 to 75 busts in the last two weeks,” said Mission. Even though he and others have been arrested, the dealers continue with their sales, but with more caution, he said. The San Francisco Police Department was contacted and would not comment on the matter. Piper's Shoe Parlor opened in Aug. 2011. The Upper Haight is a galleria of shops, bars, restaurants and cafes competing in a constantly changing market. A new endeavor—by way of shoes—steps its way up establishing prominence in the neighborhood. Piper’s Shoe Parlor at 1682 Haight St., dreamt up by brother and sister Justin and Jessica Dega, opened in Aug. 2011. Their shop is a thought-out showcasing of unique footwear revitalizing the soul of the Haight Ashbury shopping experience, according to nearby businesses. Beach explains that the shop adds diversity to the street. 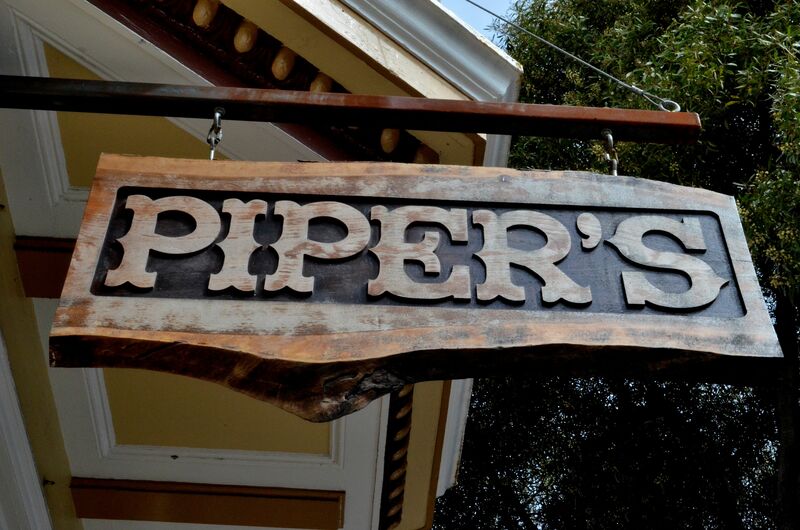 Although there are many stores focused on shoes, she says that Piper’s is a “good move for Haight,” because it is a step towards retail growth in the neighborhood. Shop owners Justin and Jessica Dega doing product inventory after receiving a shipment. Justin says that their product is what makes them stand out from similar stores. “I think we dig a little deeper than some stores,” says Justin. He explains that they look for “unestablished brands,” because they are “willing to grow” as Piper’s itself grows. Jessica agrees by saying that what makes the store work is the fact that they build a partnership with the companies that they work with. The store has received a warm welcoming thus far and they are glad to be a part of the Haight Ashbury, especially since their location happened by chance. Jessica Dega rearranges shoes on the display shelf. Maurice Lee, manager of Wasteland agrees that there is no better place for Piper’s than Haight Street. Piper’s is still within its first year and Justin and Jessica are in the process of learning their business with hopes for great growth. She says that within the next five years they plan to expand to different locations, maybe even different cities and states. “Really we are just trying to keep and learn where we stand,” says Justin. He explains how eventually they will have a responsibility in contributing to making the street “thrive” by participating in merchants associations, fund raisers and events. As for now they are putting their passions and experience to the test. The store sells everything from hats, bags, coats and jewelry, but of course their main focus is on the shoes. “We definitely like to put a lot of effort into finding things that are cool and have good design that maybe people don’t know about,” says Jessica. Business Hours: Sunday through Thursday 11 a.m. to 7 p.m.
Friday and Saturday 11 a.m to 8 p.m.